Bearings can be purchased separately. Please contact our factory for assistance. Straight Roller Bearings Because of the great popularity of this type bearing in industrial applications, they are available in most Bond Casters. All Bond roller bearing wheels are equipped with high quality roller bearings; with a split outer raceway and hardened steel rollers held parallel to the axle by a steel retainer. End washers are pressed in the ends of the hub to hold the bearing in place. A hardened and ground steel sleeve fits over the axle between the two sides of the caster fork; it is held rigid with a threaded axle bolt. This provides a hardened precision inner race for the bearing and also greatly increases the strengths of the caster. Tapered Roller Bearings All Bond casters designed for extra heavy service and high speed applications offer tapered roller bearings. Two bearings are used per wheel, one in each side of the hub and ride directly on the axle. Bearing adjustment is provided by tightening the legs of the caster against the wheel hub. Flanged Ball Bearings Bond wheels are offered with a variety of ball bearings. Generally two bearings are used per wheel. A separate sleeve is not required when the bearing contains an integrated sleeve. These are chosen for light to medium duty service. Consult factory for application information. Precision Ball Bearings A precision ball bearing is chosen in an environment where the bearing can not be routinely lubricated or there may be environmental debris. The precision ball bearing offers easy rolling motion and bearing protection. Two per wheel are used. Self-lubricating bushing A good substitute for the anti-friction bearing in small wheels or where moisture is an important factor. Shown is a sintered steel, oil impregnated. Plastic Bearings Ideal around water or corrosive substances or for high and low temperature service. Consult factory for application information. PLAIN BEARING This term when applied to Bond casters and refers to machined bored wheels running directly on the axle. An economical practice for seldom moved loads. Bronze, Bronze with graphite, Drawn cup roller bearings are just a few of the alternate choices for wheel bearings. Consult factory for application information. All Bond casters and wheels are lubricated at the factory with a good general purpose industrial lubricant. For a slight extra cost, you may specify a lubricant to meet special environmental requirements – low or high temperature, or other considerations; consult the factory. Each Series Caster offers raceway or pressure fitting (zerk) lubrication or when pressure fittings are not specified on the wheel an option is to use a drilled for oiling axle and when required, a drilled for oiling sleeve. Grease seals can be used to reduce the lubrication with some applications. When lubrication is a problem there may be other solutions available; consult the factory. Hardened and polished steel balls in a deep formed race designed not only to carry the load but also to absorb side thrust between the deeply embossed outer apron of the base and the formed inner flange of the fork. A deeply formed, coined work hardened race with hardened and polished steel balls carries the load and absorbs side thrust. A matching lower race balances the load and absorbs component thrusts. Hardened and polished steel balls in a smoothly coined and hardened upper and lower raceway assure easy swivel action and long service life. Swivel design provides maximum protection for the king bolt. Large diameter hardened and polished steel balls in a large diameter precision machined raceway constitute the main load bearing. The secondary load bearing is a precision unit tapered roller thrust bearing. Recommended for trailer type service. Main load bearing is a large diameter self-contained precision roller bearing. Secondary load bearing is a tapered roller bearing. Both bearings are replaceable as complete assemblies. Recommended for continuous, extra duty service. 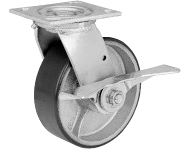 OTHER COMBINATIONS OF BEARINGS are used to facilitate long life or ease of movement in customized casters. Consult factory with your application. Please contact the factory with your needs. 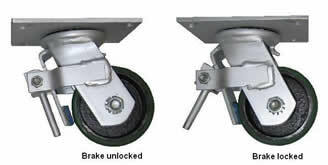 Heavy duty service: Thumb brakes, face contact brakes, Truck locks. Grease Seals are used to prevent debris from collecting in the caster grease or to prevent grease from escaping. Raceway cup grease seals can not be used when there are certain types of brakes or when there is a 2 or 4 position swivel lock. Raceway grease seals are factory installed. Wheel seals can be purchased separately. AXLES - Various types of axles are used and are specific to the caster. Axles can be purchased separately. Please contact our factory for assistance. Cotter pin axles: Used in lighter duty casters. These axles have a round or square head or combination of both and are secured with a cotter pin. Hex Head Axles: These axles are the most common. When the wheel has a grease fitting the axle is solid and supplied with a nut. When the wheel does not have a grease fitting the axle is drilled for oiling with a grease fitting in the hex head. The grease is supplied at the center of the wheel through the grease fitting. Crown Nut Axles: These are used primarily for heavy duty service. The crown nut is secured with a cotter pin through the nut. SLEEVES OR TOP HATS - When a sleeve or top hat is used it creates an inner raceway for the bearing to ride on increasing the life of the bearings and weight capacity. Sleeves and top hats can be purchased separately. Please contact our factory for assistance. Sleeves are used between the roller bearings and the axle; secured in place by the fork legs creating a fixed inner raceway for the roller bearing to ride on. These are usually hardened metal and ground to improve performance and longevity. They are specifically sized and a listing is found under caster accessories. Top Hats are used between the ball bearings (when not part of the bearing unit) and the axle. They are shaped like a top hat to prevent the caster fork from disturbing the bearing's action. REPLACEMENT WHEELS - Wheels are easily chosen in the Bond wheel listings. Bond has included the caster type for each wheel listed. Please refer the the wheels listings, sizes and rated weight capacity of the caster to chose the coreect replacement wheel. Please contact the our factory for the components requried to restore your caster to the original working condition.